Thank you for that beautiful post! 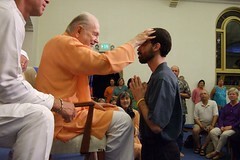 I live at Ananda Village and didn't get to go see Swami Kriyananda's talk in Palo Alto, but it was a delight to read about it here. Thank you for sharing your experience in such an open and sincere way... It's made me think about how I can improve my own writing.